Well, well, it is about time I did a post on shoes. Or boots in this case. I think my heart really does belong to bags but every girl needs a pair of boots, or three. 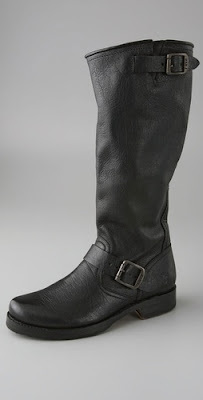 I love these Frye Veronica Slouch Boots. They are definitely a casual boot, perfect for running around doing errands on a cool day. I love the buckle at the top and on the ankle. I also love the masculine feel of this boot. It gives it a little bit of edge. I would probably wear this with leggings and a long t-shirt for ultimate comfort. I've wanted a pair of Frye boots forever, but I keep worrying that in size 10 they're gonna look huge! I really like these Veronicas, the rounded toe (as opposed to the engineer square-y one) are nice. They are really cute!